The Red-necked Parrot or Dominican Amazon (Amazona arausiaca) - also known as the Dominican Blue-faced Amazon, Lessor Dominican Amazon and Jaco Parrot - is an Amazon parrot that is native to South America, specifically the Island of Dominica in the Caribbean Lesser Antilles. They prefer lowland and montane forest areas to 2,600 ft (780 m). With a population of less than 400 birds, this striking-looking parrot is very endangered due to habitat destruction and hunting. They are mostly observed singly, in pairs or in small groups. Other than their early morning and late afternoon calls, they are very quiet and are difficult to detect as they are well camouflaged by plumage. They are agile climbers and are likely migrating seasonally depending on food supplies. They are spectacular flyers with powerful wing beats; occasionally interspersed with gliding phases. Their calls are usually harsh and croaking; occasionally sounds similar to those of humans. This parrot averages 15.75 - 60 ins (~40 cm) in length. Its plumage is primarily green, but the feathers of the nape, neck and back are tipped with dusky black. The forehead, crown, lores (the regions between the eyes and bill on the side of a bird's head) and cheeks are violet-blue, and the feathers at the middle of the lower throat are red, hence the name "Red-necked Amazon Parrot." Their bills are horn-colored with grey tips. The irises are orange-red and their feet are grey. Immatures birds look similar but can be distinguished by their brown irises. 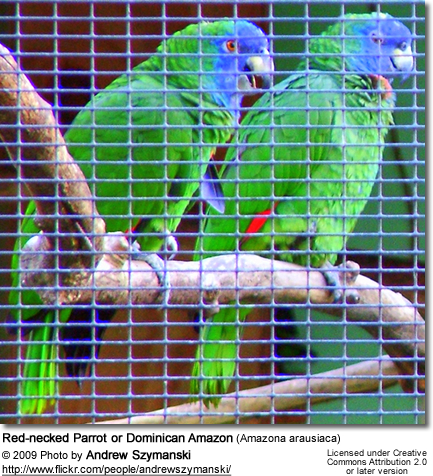 Breeding in aviculture has not yet been achieved, except for one hybrid Red-necked / Yellow-crowned Amazon that was raised in Dominica. This hybrid was then paired up with another red-necked amazon parrot and they successfully produced offspring. A roosting / nestbox should be provided with approximate dimensions of 14 x 14 x 48 ins (35 x 35 x 120 cm). 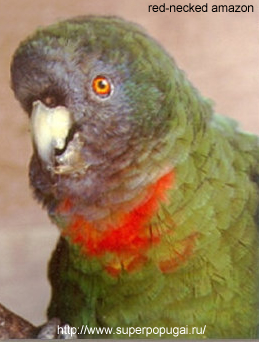 This is a medium-noisy to noisy parrot, whose calls are heard particularly in early morning. They are hard chewers and enjoy bathing. Bird Grooming: Benefits of bathing (SAFELY) and recommendations. The breeding season starts in March and goes on until about July. These amazon parrots nest in the hollows of tall trees. The average nest consists of 1 to 3 eggs - which are incubated for about 28 days. They need spacious outside flights, with minimum dimensions of 30 x 9 x 8ft (10 x 3 x 2.5 m) with adjoining inside area 9 x 9 x 8 ft (3 x 3 x 2.5 m); metal construction essential as they are heavy chewers.